Despite trade headwinds and an oil shock, Canada’s economy remains on track to grow this year and in the “forecastable future,” Finance Minister Bill Morneau said. 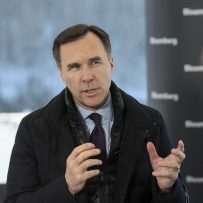 Morneau, speaking in an interview Friday at the World Economic Forum in Davos, Switzerland, said a November shock in Canadian crude prices is negatively impact the nation’s economy, but private sector economists continue to anticipate the expansion will continue. Morneau is preparing Canada’s annual budget, which will serve as a de facto campaign document for Prime Minister Justin Trudeau’s government as it aims for a second mandate in an election this fall. The November oil shock was spurred by a supply glut and pipeline crunch. Prices have recovered somewhat, but clouds remain for Canada’s crude outlook. Asked about a recent slowdown in growth in the Canadian economy, Morneau pointed to the oil sector as a factor. As a feud with China continues, Morneau said the tensions are having a chilling effect for some travelers and investors, but there are no signs the Asian country is actively trying to hurt Canadian economic interests. I “can’t really directly say that I’m seeing that,” he said, citing recent strong Chinese demand for Canadian government bonds.